BMW M3 CONVERTIBLE - INDIVIDUAL! 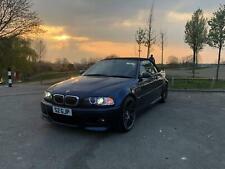 BMW M3 CONVERTIBLE (2002) - MANUAL. I have made a few modifications which are all reversible if so needed. Next service due in 7200 miles. Engine has been kept standard and maintained regardless of cost, the car drives and sounds great, last of the straight six normally aspirated M3's. BMW M3 e46. Most desirable combo of Manual and Coupe body. Oil Service 17-05-17 83,696 miles. Oil Service 29-04-16 80,233 miles. Inspection 1 20-03-14 71,379 miles. Inspection 2 02-08-12 59,952 miles. I will do a deal against cars of interest such as cosworth / rs turbos / 911 (996-997) / C63 / Vauxhalls (novas/ cavalier turbos) etc with money either way. It may have a few more miles on it, but they are a very rare beast in saloon form and even rarer in this condition. 2004 BMW M3 Manual E46 Convertible Fully Loaded With GENIUNE 19" CSL ALLOYS. 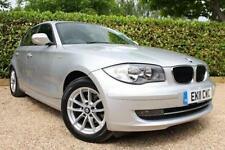 The car has genuine CSL alloys, all tyres are good and passed MOT (no advisories). CSL 19" alloys. Silver Grey AO8 E46 M3 with Full Service history 109k and a manual gearbox. BMW M3 F80 2015. When I got the car I wanted it to look dead right so I put all the carbon on. Just look at a standard M3 to a M3 with all the carbon on there is one hell of a difference. This car is the ultimate head turner everywhere I go people want pictures with it and break their neck looking at it Hahaha. BMW E46 M3 FSH 100k phoenix yellow SMG2 sequential manual/auto px? E46 m3 smg2. I have owned the M3 for the last 18 months, its been a great car, an appreciating classic. Full BMW and specialist service history stamped up to date including running in service, loads of paperwork and invoices, 1OOK. This is a stunning example BMW M3 E46 Convertible, finished in Carbon Black. Full service history and lots of receipts. For sale is my BMW M3 E46 SMG in Mystic blue, the best colour. Ihave been averaging under 2000 miles per annum in it for the last few years and while it's a fabulous car it needs driving, hence the sale. Apple CarPlay preparation. Comfort access. Head up display. Loudspeaker system Harman/kardon surround sound. Speed limit display. E36 m3 cabriolet ls1 swapped. Good tyres all round. Clean black leather interior. MY BMW E46 M3 IN ESTORIL BLUE. COUPE BODY TYPE WITH SMG GEARBOX. 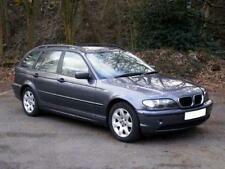 JUST 67,000 MILEAGE FROM NEW, A REAL APPRECIATING MODERN CLASSIC. THIS HOWEVER IS A COMMON ISSUE THAT IF I WAS KEEPING MYSELF WOULD BE DONE AS PREVENTATIVE MAINTENANCE COSTING £700. The Van Yard Ltd - Visit us for a test drive and please quote/mention Ebay Motors when calling or coming to see us! - Call us on 441246389558 or click here to find out more. Personalised number plate worth £500. BMW M3 E92 4.0 V8 in Jerez black. Factory 19" alloys powder coated black. AUX and USB ports. Programmable M Button and settings. Hill-start assist. Rain-sensing windscreen wipers. A cherished example - Enthusiast owned - Subframe done! It’s standard apart from a Carbon M3 cup intake (Sounds Lovley) and M3 cup Racing MAF sensor, I do have the standard air box and MAF to go with the car. Also the car has had a stud and wheel nut conversion as apposed to the standard wheel bolt design which is much better. Black M3 badge. -New genuine BMW badges front and rear. -Front splitter is cracked. Bad points. -Parking sensors. -H&R lowering springs. -4 pipe back box mod. -19 x 10 Aluwerks wheels. 2003 BMW M3 3.2 MANUAL CONVERTIBLE. FULL SERVICE HISTORY. NEW GENUINE BRAKES ALL ROUND. FULLY HPI CLEAR. ALL ELECTRICS WORKING AS THEY SHOULD. MORE INFO AND PHOTOS AVAILIBLE UPON REQUEST. APPRECIATING MODERN CLASSIC. MOT till FEB 2020. - Saying this it was last serviced around a few hundred miles ago, last year in February given that I've only driven a few hundred miles it could be due a service. Here is my 2004 BMW M3 3.2 Petrol Convertible in Titanium silver. Parrot blue tooth phone connection. Engine and gearbox are perfect, no knocks or rattles. Located in Hall Green, Birmingham. First aid kit and tool kit are present. 2 keys included and the service history. Town Farm Cars - Please feel free to email us or phone us with any questions you may have. - Call us on 441760307043 or click here to find out more. FULL 12 MONTHS MOT. BMW M3 M SPORT 5 DOOR SALOON HERE WE HAVE MY BMW M3 FOR SALE THIS MODEL IS QUITE RARE FOR SALE IN THE COUNTRY. 82,000 THOUSAND MILES. BMW PROFESSIONAL RADIO. ANTI DAZZLE REAR VIEW MIRROR. FOR SALE WITH MUCH HESITATION IS MY BMW E92 M3 COUPE IN SPACE GREY. THE CAR IS IN MINT CONDITION FOR YEAR. BMW VEHICLE CHECK CARRIED OUT BY COOPER BMW DURHAM 15/07/16, NEXT DUE 7000 MILES OR 08/2019. I have owned this car since December 2016. Electric Seats. Electric Windows and roof. Vehicle is CAT D from October 2016. The car is my pride and joy and is only used on weekends. Age related marks on the vehicle. 67k low miles. BMW M3 E46 Silverstone Edition. HK Stereo / Sat Nav. My BMW E46 M3 Manual coupe 2003. Owned it since April 2014. 04/01/2016 BMW Sytner Coventry - Oil service 116,858. 18/12/2014 BMW Cotswold Cheltenham - Inspection two 104,377. 23/01/2015 BMW Cotswold Cheltenham. Its got the newer M3 alloys wheels so rubs a little on full lock. electric roof works perfect. no lights on dash. Had the important running in service. full service history. sold with one key & log book. Alexanders Prestige - Visit us for a test drive - Call us on 441423226351 or click here to find out more. This M3 is in superb condition for its age and being the drop top E93 coupled with the amazing sound of that V8 - a real head turner!, which is exactly why i bought her. HPI clear. Always kept in a locked garage. 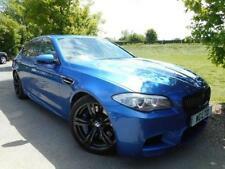 M3 e92 EXCEPTIONAL CONDITION,FBMWSH,38K,TOP SPECIFICATION,M3 PRIVATE PLATE. (Otherwise facIng £2000.00 bill to replace throttle actuators on any m3 e92 if they have not been replaced). It drives like an absolute dream, it is so smooth and effortless and always puts a huge smile on my face. BMW E46 M3 Silverstone Edition. Number plate not included. Very good condition. 4 previous owners. Sat nav ( usual missing pixels on screen). Folding mirrors. All electrics (4xwindows and mirrors). FSH (including running in service @ 1500 miles). Genuine reason for sale. No issues with this car what so ever. HPI clear. Here for sale is great BMW M3 E92 M3, a V8 Manaul! It's a really fun car to drive and makes all the right noises! Being Manual it gives you a great driving feel. 2008 BMW M3. - CD Changer. Grpahite Grey - Black Leather Interior.